The Pre-Order for Carbon County published by Zatara Press is available via Kickstarter here. I’ll be attending the opening reception at USAGI Gallery - come see me and say hi! A tree stands atop a rocky crest overlooking the valley as the warm light of an overcast sun illuminates the scene. Road signs for Route 19 and 460 point right. A barb wire fence separates the viewer from the tree. 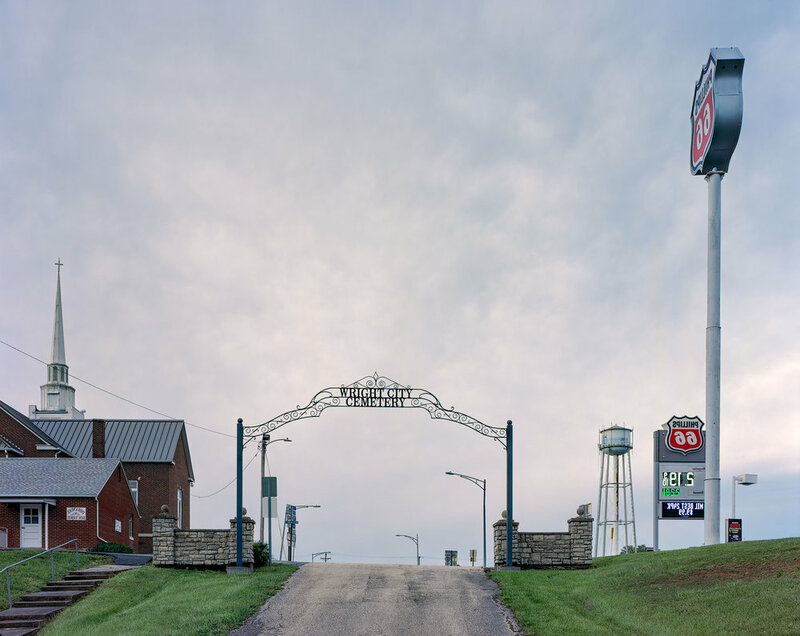 An interview on Railroad Landscapes and other projects. This is the Greyhound Bus Museum in Hibbing. 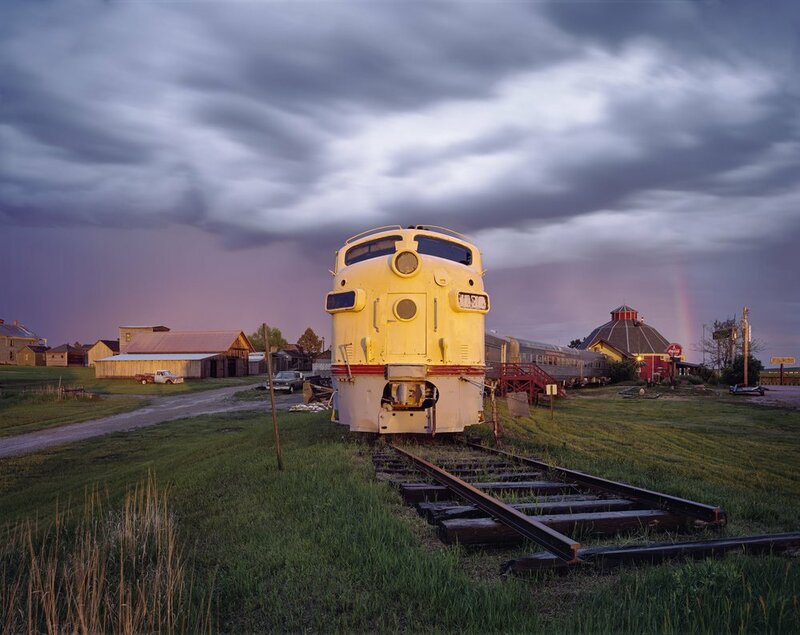 It was taken on a road trip to photograph railroad landscapes and the Iron Ore mine in Minnesota. A silver and blue bus sits alongside a replica of a bus depot. 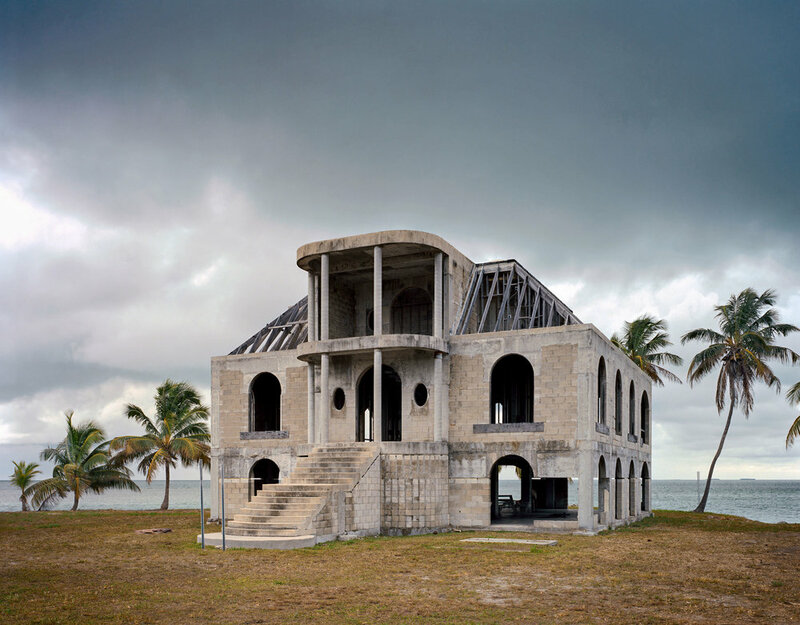 This cinderblock mansion in the Florida Keys is constructed to resist storms and flooding. Palm trees flank the house against a stormy grey sky. The Broadway-Fillmore neighborhood in Buffalo is most known as home to Buffalo Central Terminal. It was once a major Polish/Eastern European neighborhood before being a victim of white flight to the suburbs. In the foreground we see lawn chairs and a sign which reads 'keys'. I met Dan at this overlook along the Susquehanna River in Pennsylvania. In the background are former fracking sites. Dan related several stories of how the fracking industry has impacted him. He comes up here to practice. Large building in the background was once part of Bethlehem Steel, a major employer in this rust-belt region of the United States. Steel mills closed rapdily during the 1970s and 80s. The building burned to the ground in 2016. This image was taken in 2009. Four boys, two of which are twins, stand infront of Battery McIntosh, a former coastal artillery base of the Endicott period. It is now a national historic site. This portrait was taken on 8x10 inch Kodak E100G film. In this roadside view printed in reverse, the view from inside a cemetery peers outward at a church steeple surmounted by a gas station sign. A sign I found along the road in Alabama. A large arrow points into the frame, for what might have been a drive-in theater. Stormy clouds move overhead and a cinderblock base sits below the sign. With a population of 7,000, Livingston Montana is situated north of Yellowstone Park. It was historically a railroad city until the 1980s. Directly below is the historic former Northern Pacific Railroad rail yard and engine shops. 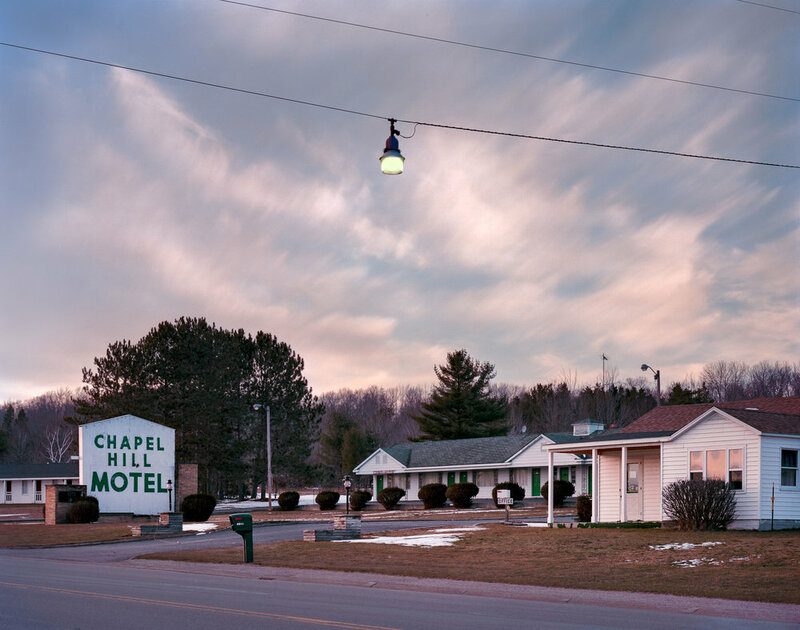 Located on the banks of Lake Michigan, the motel is illuminated with the setting sun along U.S. Highway 2. A streetlight strung across the roadway is set against dappled clouds. Razed in 2015, Nepera Chemical is a superfund site and operated from 1942 until 2005. Nepera produced pyridine, used in agrochemicals and pharmaceuticals, as well as niacin, a food additive. The American Flag on the tank is symbolic of declining industry. 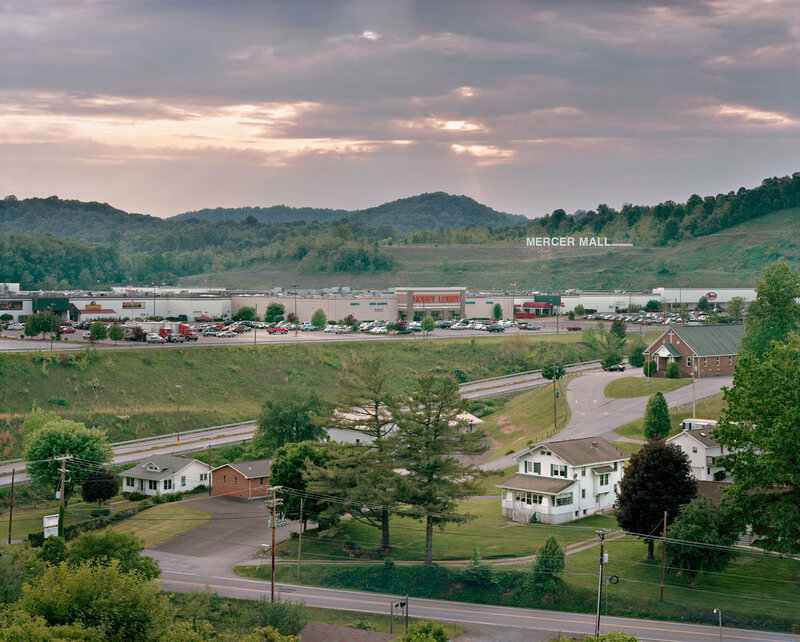 The rolling hills of West Virginia are filled with houses and mobile homes in this elevated view. 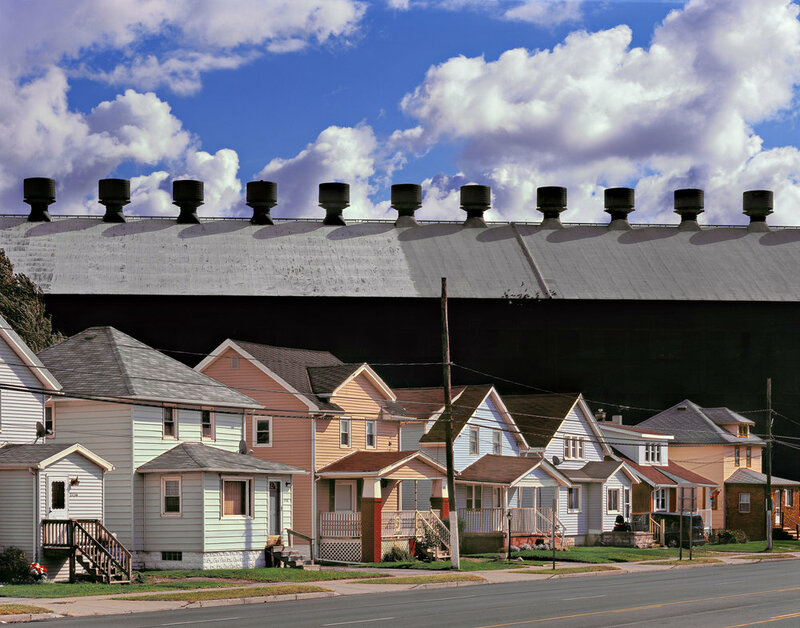 Residential landscapes such as these explore the way we inhabit our environment. The red shack provides a focal point for the image. This scene shows the collapsed rail bridge across Kinzua Creek. It was listed on the National Register of Historic Places in 1977 and as a National Historic Civil Engineering Landmark in 1982. The ruins of the Kinzua Bridge are in Kinzua Bridge State Park off U.S. Route 6 near the borough of Mount Jewett, Pennsylvania. A tree stump gestures skyward against a cloudy overcast firmament. This elevated view shows a mall, Hobby Lobby, and a church with houses in the foreground. The sun is setting behind the mountains. What interested me in this scene iis how it ncludes residential, commercial, transportation, and religious elements all in one aspect. This was taken on 8x10 Kodak Portra 400 film. This Veterans of Foreign Wars sign in Napoleon, Ohio is located adjacent to agricultural structures. This night scene is illuminated with ambient light from surrounding street lamps. This is the National Naval Aviation Museum at Naval Air Station Pensacola. Included here are propellor and jet powered aircraft spanning the 20th century. The image shows the intersection of Willet’s Point Boulevard and 37th Ave in the borough of Queens, New York City. The area is colloquially known as “The Iron Triangle” or “Willets Point”. The area was originally the city’s ash pit and referenced in The Great Gatsby during one of their sojourns driving into the city. Since the 1950s it has been a junkyard and auto repair mecca. There is no plumbing or city services to the area – you can imagine the smell. 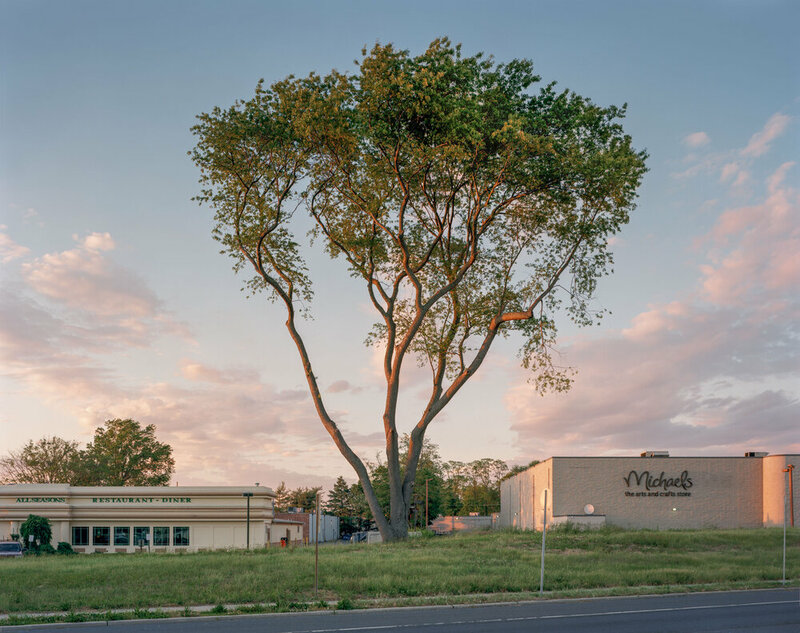 In the last few years it has been in the cross-hairs of city government and private interests as they are hellbent on franchising the neighborhood into shopping and residences. In fact, demolition has already begun and the structure (if you would call it that, many of these auto repair shops were housed in nothing more than an arched steel shed) I stood on create this picture is now gone and the rest of the neighborhood seems to be following suit. I spent many days wandering Willets Point, which is really only about a 2/3 of a mile in size photographing the colorful facades and people that worked there. The figures in the scene are not posed, I waited about two hours for the right combination of light and subject placement. Like many of my images, the area was scouted out well ahead of time. Willets Point has been in my memory since I was a child, as my father would take his truck there for parts. It was shot on my 8×10″ camera using a Fujinon 600mm C lens and Kodak Portra 400 film. 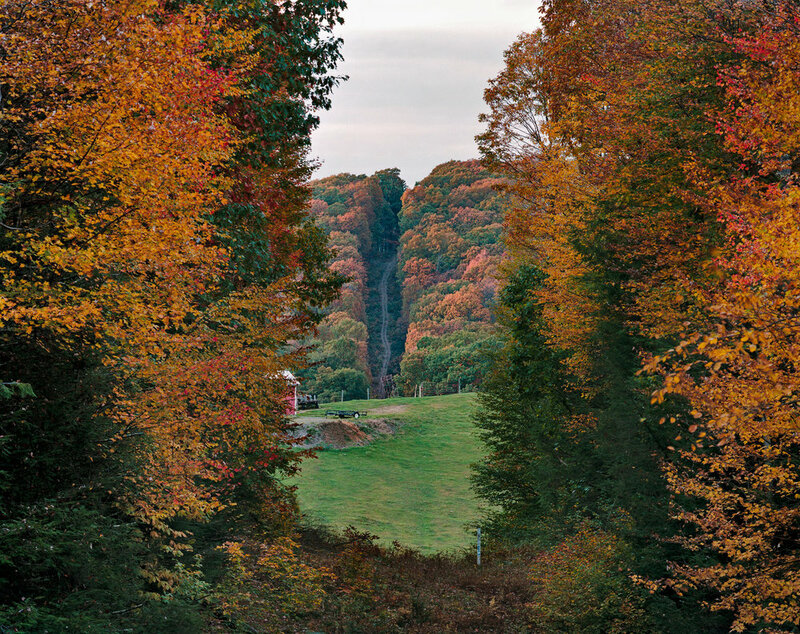 This opening in the forest and subsequent pathway up the hillside is a clearing made for a pipeline. The midground shows rural buildings and a trailer under overcast skies. Duluth is a central desination for offloading Iron-Ore from the Missabe Iron Range onto ships destined for steel mills farther south in Illinois and Ohio. Three bikers are seen infront of the vast industrial and transportation landscape. 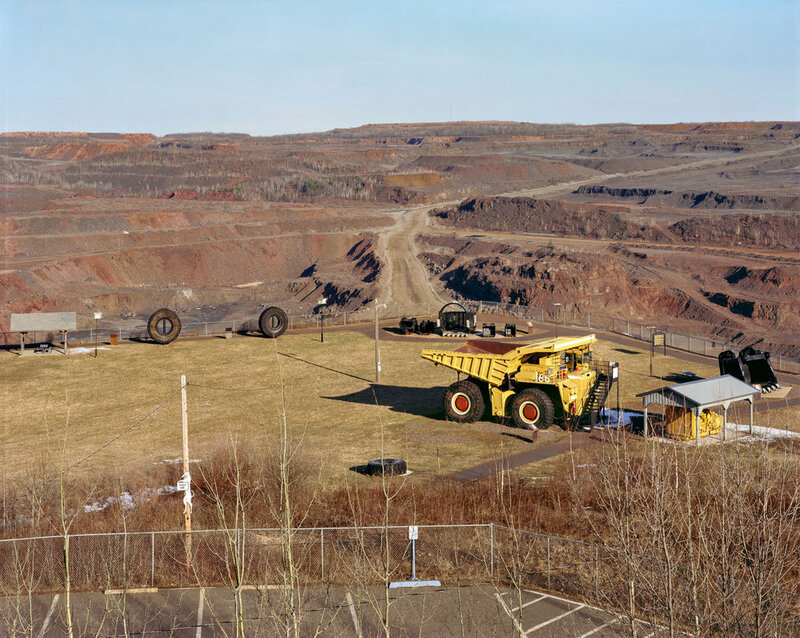 This view shows the Hull–Rust–Mahoning Open Pit Iron Mine in Hibbing. With a 1.5-by-3.5-mile footprint and depths up to 600 feet, it is one the largest in the world. In the foreground is a mining museum. Like many scenes, I sought out an elevated 'worldview' viewpoint to explore the surrounding topography with detail. 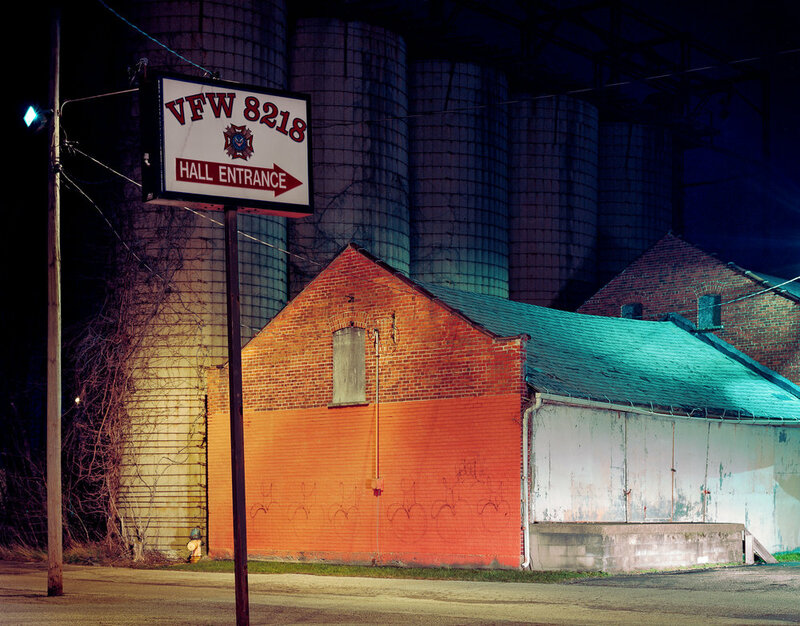 A fresh spring rain makes the old steel mill in Youngstown, Ohio, glisten in the light as the storm clears. Youngstown was once played a role in America's steel production, but today is plagued with unemployment. It is central to what is called the rust belt. This view from Albany County, Wyoming, shows the Big Hollow, the second largest wind-eroded depression in the world. It is 11 miles long by 4 miles wide. This scene in Western Pennsylvania shows a graveyard and a large tree in the center of the frame under a cloudy bright sky. With a road stretching into the scene and a small shack below the tree, this scene was influenced by Aaron Copland's Appalchian Spring. Arthur Dunn has walked hundreds of miles across the midwestern United States with his cart which reads "The Lord is my Shepherd." He was walking around Lake Erie when I met him here in 2015. 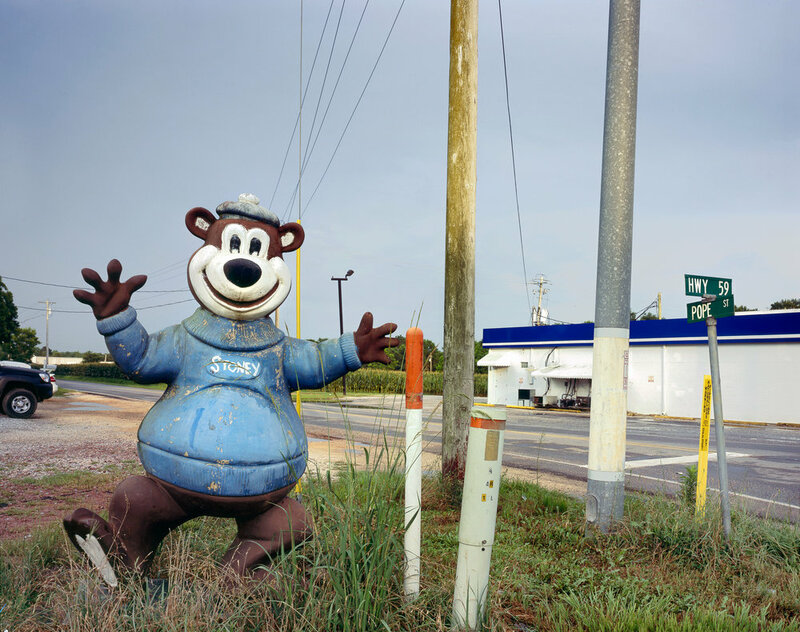 A former A&W Root Beer Mascot stands along Pope Street in Alabama. A family of cattle ranchers who live in the shadow of Elk Mountain, a landmark along the Old Overland Trail, in Carbon County, Wyoming. An empty, colorful playground fronts a Church of Christ centered in the frame. Flanking the scene are cherry blossoms in bloom. 2014 Streamliners at Spencer event at the North Carolina Museum of Transportation included over 20 streamlined locomotives from across the United States. A green pool sits at the bottom of a limestone quarry in West Virginia. En elevated view of Willets Point, otherwise known as the Iron Triangle neighborhood in Queens, New York City. An auto repair center for over forty years, much of the area is now demolished to make way for new construction. A large advertising screen and street lights illuminate the surrounding industrial neighborhood of Long Island City. Dusk descends over the New York City skyline as a concrete plant and vehicle lights flank a highway lightpost. Among the ruins of a burned out roadside diner sits a memorial constructed from its remains. 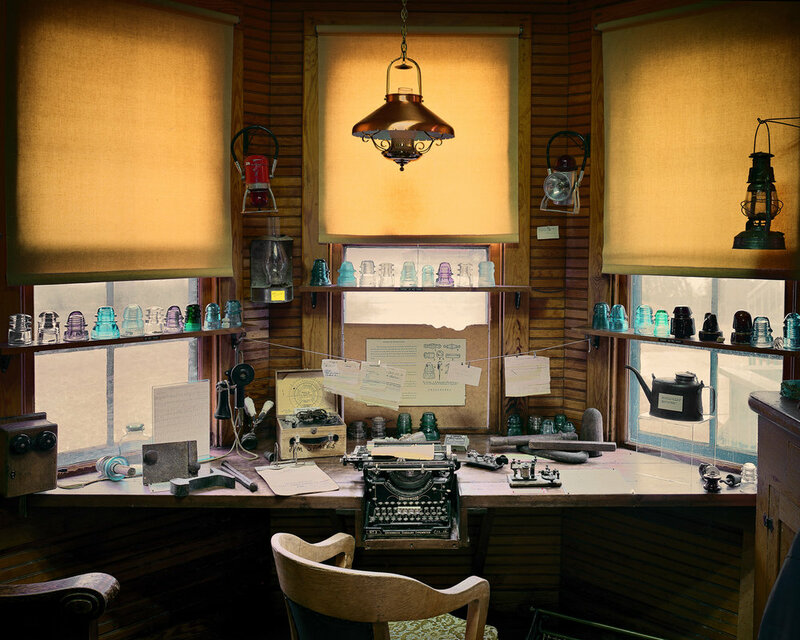 Railroad station master's desk includes colorful insulators, a telegraph machine and a typewriter. "+getDescription+""; var findimg = $(this).find('img'); //test from here var getimgdimensions = $(this).find('img').attr('data-image-dimensions').split('x'); //alert(getimgdimensions); var imagecalc = Math.round(getimgdimensions/(getimgdimensions/72)); //alert(imagecalc); //to here //var imgWidth = 22; // alert(imgWidth); // data-width='"+imagecalc+"' data-height='72' width='"+imagecalc+"' height='72' // alert("height: "+testHeight+" width: "+testWidth); $('#gallery-1').append("